When it’s 70 degrees and sunny in October, flu and cold season seems farther away than ever; however, that doesn’t mean you can’t start playing defense by boosting your immune system now. Truthfully, I believe that a whole foods, well-rounded diet, combined with a healthy dose of physical activity is the best year-long medicine, but there is a group of foods that can help to fortify your most crucial defensive player during the winter months. I’m talking about probiotic foods and your gut. 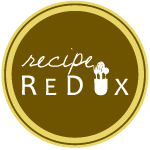 I am so excited to share this week’s recipe with you all, not only because it’s incredibly easy and delicious and making me more excited for all things roasted, warm, and fall, but because this is my first entry for The Recipe ReDux challenge! New York City has not been shy about welcoming fall this weekend. The temperature dropped a cool ten degrees, pumpkin-this and pumpkin-that waves at you from every storefront, and footballers have taken over the bar scene- fall is finally here! Wrapped up in a cozy sweater, with a warm mug of tea, I’m waiting to take my Sunday morning trip to the farmers market to see if my fruit farmers have brought their apples to market yet. While I usually get more excited about other cool-weather produce, such as butternut squash and parnsips, I’m especially eager for this season’s crop of apples so I can eat them with my delicious Chai Spice Almond Butter.